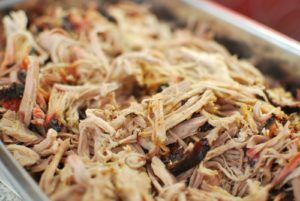 There are a lot of delicious barbecue based pulled pork recipes but if you are looking for something different to try that will feed a crowd then this vinegar based pulled pork recipe will be a big hit with your family or at your next potluck. It is more of a Carolina Style barbecue and it doesn’t require a traditional tomato based BBQ sauce. I used a large, 8 pound pork shoulder that I got for a very reasonable $1.49 a pound. 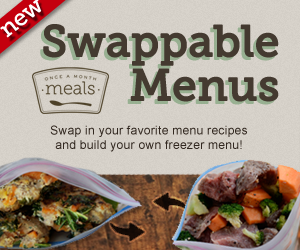 This recipe will definitely feed a crowd or just make for your family and freeze extra for a future meal. Place onions on bottom of slow cooker sprayed with nonstick cooking spray and place pork shoulder on top,fat side up (you can also trim some or all of the fat first but I leave it on and removed it later). In a small bowl combine remaining ingredients and pour over the pork. Remove meat to a platter and discard fat, bone and onions. Strain liquid and set aside. Place pork back in crock pot and shred with two forks. Add some of the liquid back in with the pork until it well moistened. Serve as is or on rolls with a little barbecue sauce if desired. We like to serve this on rolls with potato or pasta salad, pickles and coleslaw. For this recipe I used my 6 quart travel slow cooker that is perfect for transporting to picnics and potlucks because the lid locks in place. It’s also a great size for roasts and other large cuts of meat. *Cooking times will vary depending on your crock pot and how large your pork roast is. When I made this the first time I cooked an 8 pound pork shoulder on high for 6 hours and served a few slices with dinner. I allowed the rest of it to continue cooking for another hour on low and by then it was easy to shred. If using a smaller pork shoulder you can simply cut back on the ingredients and reduce the cooking time slightly.